Your Word reminds us that Your Love Never Ceases, Your Mercies never come to an end, Your mercies are new every morning and your faithfulness is great. It's hard to remember this when we feel like we're struggling or are hurting. It's hard to experience this when we are in the midst of a tough season, feel unloved, forsaken and completely hopeless which is the unfortunate truth sometimes due to the circumstances of life. Life is hard sometimes and You are always right there with us! 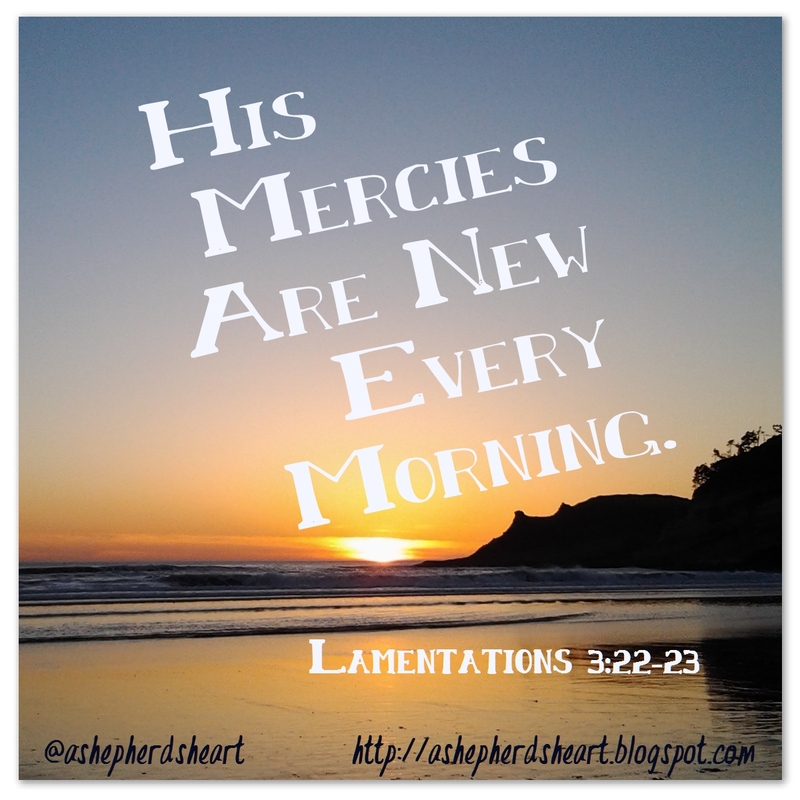 May You daily help us see, experience and know your mercies are truly new every morning as you give us life each day to live for you! When we're struggling, maybe hurting because someone who loved us left or a friend or loved one was unloving or unkind - please help us to see that Your love is still evident and it never ends no matter how we may feel. When we're feeling hopeless, please be our hope...help us break the thought patterns we're stuck in because of the circumstances we're facing so our vision can clearly see You are our only true hope! Your Word also reminds us that in Christ, We are new creations and the old has past away and new things have come! Because of this we can rise and experience a new beginning each day. A fresh start...with the past behind us. Not that we won't face consequences of our sin and or mistakes but none-the-less You give us each day to dust ourselves off and begin anew! May You helps see and live out the truth that in You, we are new creations and You've given us a new beginning...a new lease on life. As we rise and take in the air You've given us to breathe, may we see that moment, that day as gift from You. May we see that You love us and have a purpose for us here on earth to live out for you. No matter what we're going through, may You stir our hearts so we might begin again. Help us to actually live our lives in such a way that people see the new life You've given us! Helps to live as if we're truly alive seeking to make every moment count! Please help us to wrap our minds around the truth of your Word as we awake and strive to live out each day for your Kingdom and Glory. Please show the evil one and his demons the door because our lives are Your dwelling place and there's no room for him in Your house! May his influence diminish daily as we abide in You and Your Word as darkness and light cannot coexist. I praise You and thank You. In Jesus name I pray, Amen. A beautiful reminder when the fog surrounds us. Thank you for sharing this, it is definitely a keeper. God bless you. Thank you for taking the time to leave a comment. I love to hear from those who stop by to read what is posted and love to interact. It's a real blessing! Amen, it's something that God laid on my heart and I prayed and captured what came through the prayer. God bless you! Thanks again!